As the electioneering campaigns for the February 2015 general elections continue to gain momentum in Imo State former Speaker of the Imo State House of Assembly Rt. Hon. Ike C, Ibe has said that the Imo state Government under the leadership of Governor Rochas Okorocha has received about =N=1.2 trillion from federal allocation, allocations to local government councils and loans from financial institutions. The former law-maker and one time governorship aspirant in Imo State made this remark during a town hall meeting the leadership of the All Progressives Grand Alliance (APGA) had with artisans under the auspices of Orji Mechanic and Allied Workers Association (OMAWA) at Mechanic Village Orji Owerri. The legal practitioner expressed disappointment that having got such huge amount at its disposal, the state government could not improve the lives of the citizens of the state. 'Instead, what we see in Imo today is roundabouts in place of industries, low quality and valueless cosmetic programmes and projects that cannot create jobs or add value to the lives of the people…'. Barr. Ibe said that from the records that in the next 25 years, that 50% percent of the revenue accruing to the state would be consistently deducted to repay the loan obtained by the Okorocha administration. Speaking on behalf of the artisans, Chief Patrick Ugwuegbu tongue-lashed the Okorocha-led government for not keeping to its promise of improving their working environment in line with its campaign promises in 2011. Chief Ugwuegbu lamented that during the 2011 electioneering campaigns that the governor promised not only to provide water and electricity to the place but vowed to give their working environment a face-lift. 'Nearly four years into his administration our working environment in this Mechanic Village has not gained any attention from the state government. Instead the government is threatening to relocate us to Avu in Owerri West L.G.A. of the state…'. Ugwuegbu maintained that most of the artisans in the place were ardent APGA members and had been voting the candidates of the party for many years. He however, pleaded on the leadership of the party to do the little it could to alleviate their plight. Addressing the large crowd in the place, the governorship candidate of the party and ex minister of Interior Capt. Emmanuel Ihenacho thanked the group for inviting the party. He however, said that he had a plan to reorganise the place to make it more productive. 'It is my plan to first of all build a modern independent electricity Power plant in Imo State if elected a governor. That is the hob for industrialization. Mbakwe did it in Amaraku in Mbano but after he left office like, those who never knew what that plant was sold it as scrap. This mechanic village need water, constant electricity, good housing schemes for accommodation, good road network, modern equipment etc. As an industrialist, I know all these things and all them and more will I do if I have the opportunity to serve you as governor…'. The former minister also promised to engage a contractor to sink a water bore-hole in the place immediately to help the working condition in the place. 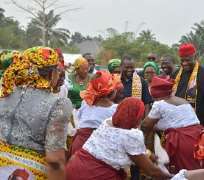 While promising not to leave APGA like Governor Okorocha did after being elected into office under the party's platform, the gubernatorial hopeful remarked that APGA has been a major political identity bequeathed to the Igbos by late Dim Chukwuemeka Ojukwu. He however enjoined the people to continue voting for the party as the only way of achieving the dreams of the Igbos. Capt Ihenacho and his team also visited the Nekede Mechanic Village in Owerri where the former minister agreed to energize an electricity transformer in the place.